Wooden Apple Trophy. 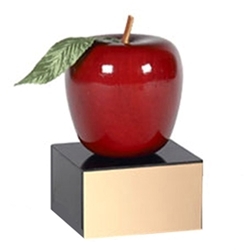 This gorgeous red apple trophy makes the ultimate teacher's gift. The red apple is made of wood and is mounted on a genuine black marble base with your free personalized message. A great way to thank your teacher for all their hard work.